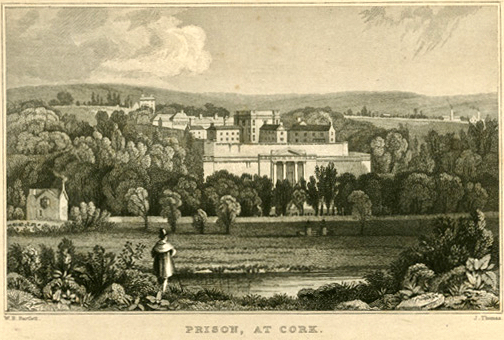 Cork City in the eighteenth century (represented above and below in Cork’s Nano Nagle Centre) had an unhealthy reputation, according to one commentator – Frenchman Jacques-Louis of Bougrenet de La Tocnaye – who travelled through Ireland in the 1790s and happily left us with some written descriptions of his journey. Born into an ancient noble family in Nantes in 1767, de La Tocnaye fled the French Revolution in 1792 and self-exiled himself to idle London (his words). Then – armed with a sheaf of letters of introduction to people who might be useful along the way – he set out on a walking journey which lasted for ten years, through England, Scotland, Ireland and Scandinavia. 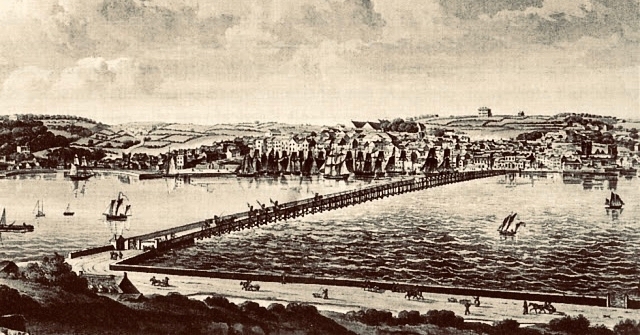 Remarkably, he was able to get his writings published as he went along and we are fortunate to have some of them preserved, after a fashion, through a translation into English by John Stevenson in 1917 of Promenade d’un Français dans l’Irlande 1796 – 1797. It is necessary to quote from the preamble set down by this translator before we embark on the writing itself. 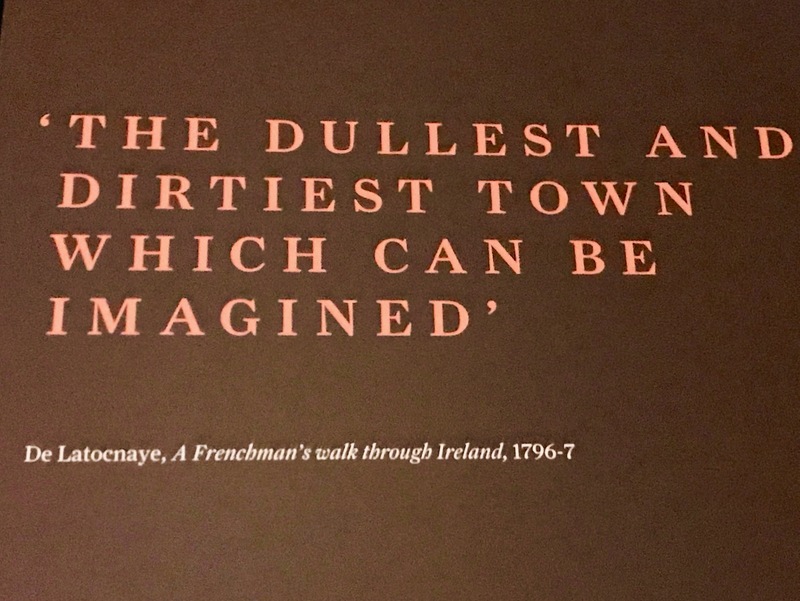 Apologies if you feel – as I do – we might be missing out on a few of the more colourful observations from de La Tocnaye on Ireland because of Stevenson’s reservations. 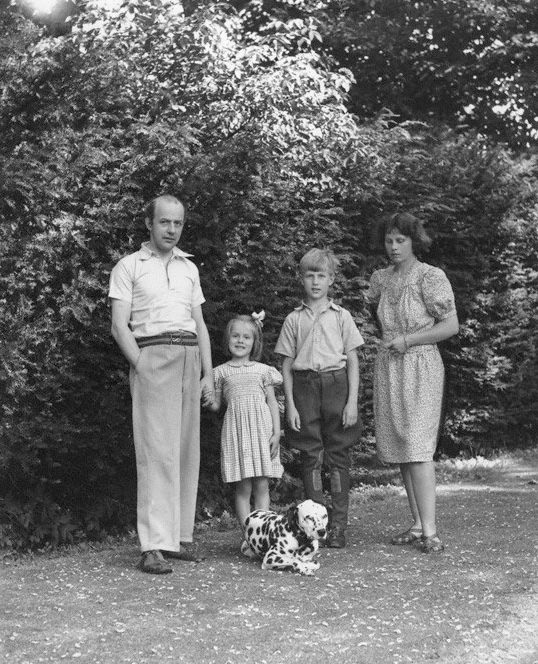 The end result is of great interest to us nevertheless.
. . . A word about the author’s style. He has none. A well-educated man, at home in the highest circles of society, and doubtless a brilliant conversationalist, he is evidently unaccustomed to writing . . . Therefore, in the rendering, it has been necessary, at times, to convey what he intended to say rather than what is actually set down . . .
. . . He has a weakness for using the swear words of the country of his sojourn, and uses them unnecessarily and unwarrantably. Second-hand matter, in the form of stories ‘ lifted ‘ from Irish authors, or antiquarian information inserted out of compliment to his friends, has been omitted as of no interest to the reader of to-day; and certain little sallies in the French manner, innocent enough, but which in English print might wear the air of indecencies, have been modified or suppressed. For the rest, the translation is as literal as a care for readability in English will allow . . .
. . . Travelling on foot over the island, east, south, west, north, his whole baggage in his pockets, in two silk stockings from which he had cut the feet, or in a handkerchief slung en sautoir on the end of a combined sword-stick and umbrella, which he said ‘made the girls laugh’ he got to the very heart of Irish life . 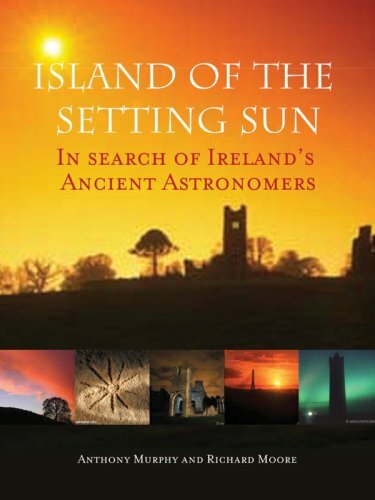 . .
De La Tocnaye’s writings on his travels in Ireland alone amount to 90,000 words! 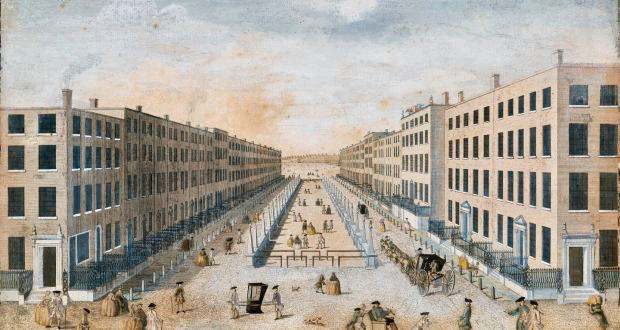 Today I am taking just a few extracts to give you a flavour of what life was like here in the late eighteenth century – seen through the eyes of one observer. I have no doubt that more of this journal will follow on these pages in time.
. . . 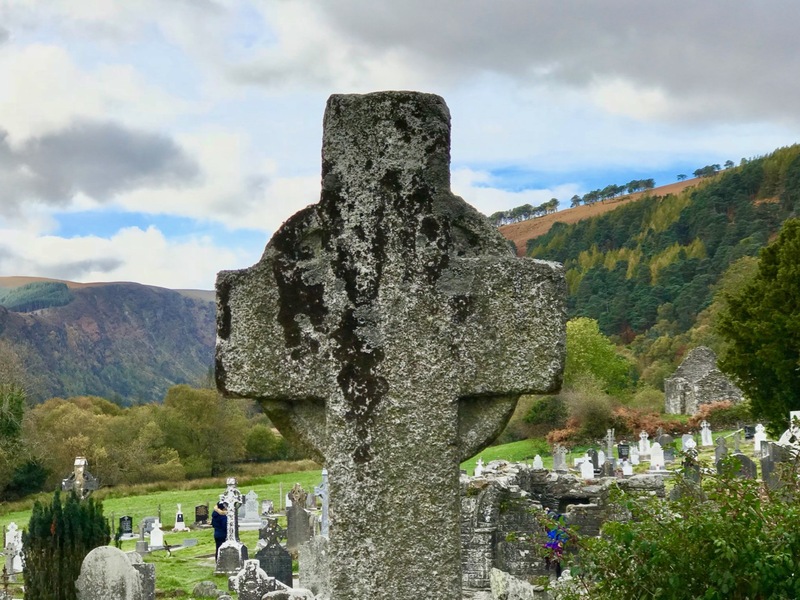 Following the course of the stream which flows from the lake, I came to Glendalough, a word which means ‘the valley of the two lakes’. It is remarkable that there is not a single ancient name in this country which has not its special signification. The appropriateness here is evident, for there are really two lakes, which join at the portion of the valley called ‘The Seven Churches.’ It is here in this desert place that are to be found the most ancient remains of the devotion of past centuries, remains whose antiquity reaches back to the early ages of Christianity. 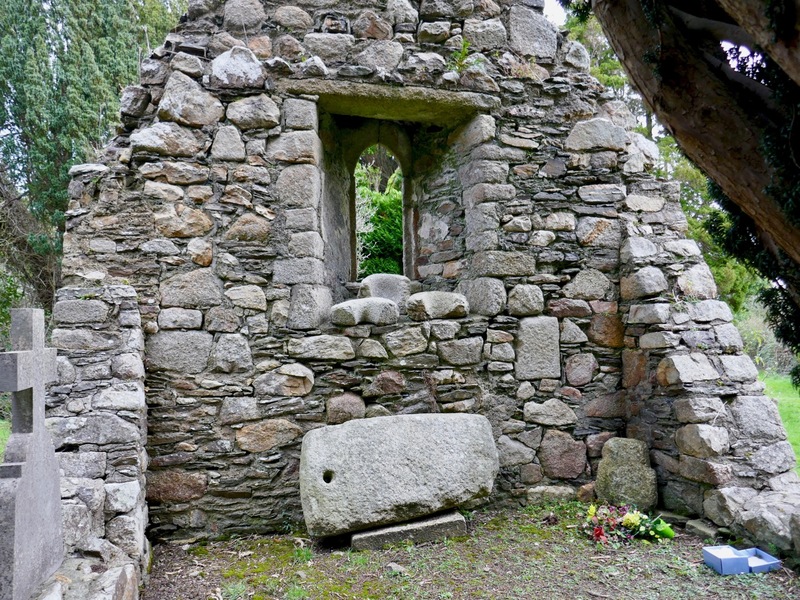 St Kevin here founded a monastery in the third or fourth century of the Christian era, probably on the ruins of a temple of the Druids, who sought always the wildest places for the practice of their cult. This was for long a bishopric, but now it is united to that of Dublin. Here are still to be seen the ruins of seven churches, and one of those round towers of unknown origin which are so common in Ireland . . .
. . . 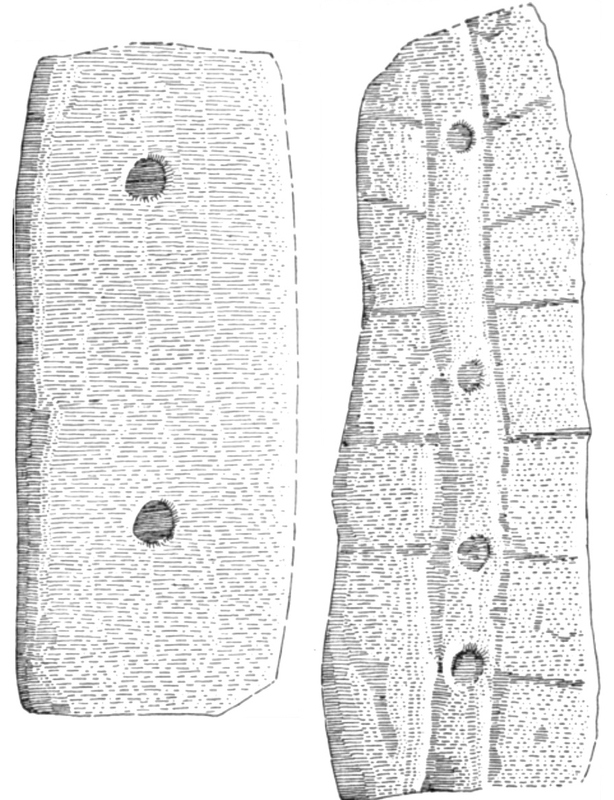 They are all alike, having a door fifteen or twenty feet from the ground, generally opening eastward, some narrow windows, and inside not the slightest remains of a staircase, unless this may be found in a few projecting stones which may have served to support floors in which there must have been trap doors to allow of passing from one to another by means of ladders. These towers are always found at some distance from a church, and entirely isolated . 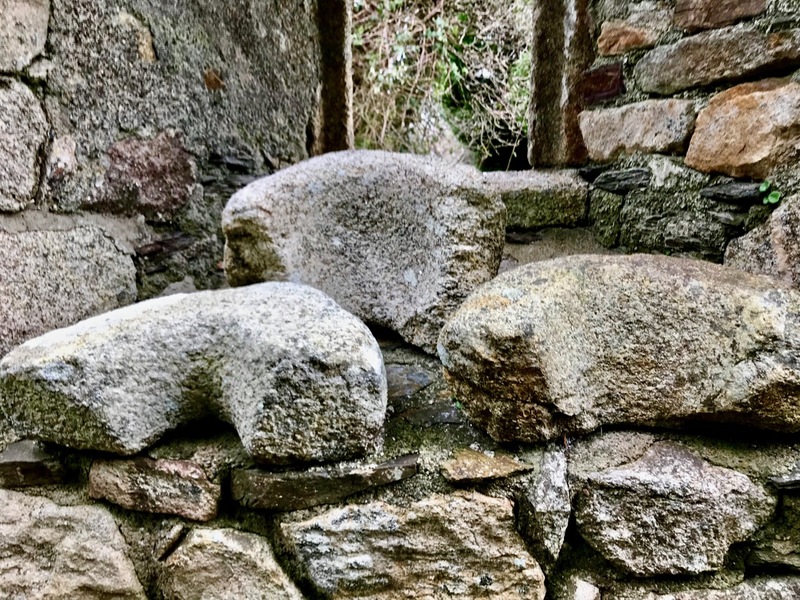 . . Whatever these ancient buildings may have been, the Irish have now for them the greatest possible veneration. 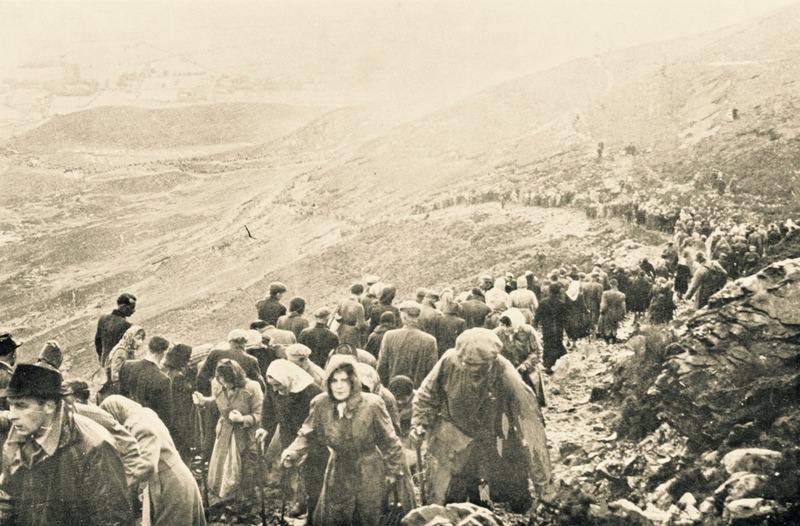 They come here from afar for pilgrimages and penitences, and on the day of the Saint, which is June 3, they dance afterwards and amuse themselves until nightfall. In this sacred enclosure are to be found remedies for many ills. Have you a pain in your arm ? — it suffices to pass the limb through a hole worked in a stone, and you are free from your trouble. There is another stone on which for another ailment you shall rub your back, and another one against which you shall rub your head. And there is a pillar in the middle of the cemetery which, if you can embrace, will make you sure of your wife. The Saint’s Bed is a hole about six feet long, hollowed in the rock — a very special virtue belongs to it. It is only to be reached after much trouble in scaling a steep slope of the mountain above the lake, but whoever has enough strength and resolution to climb to it, and will lie down in it, is sure never to die in childbirth. Belief in this virtue makes a great number of wives, and of girls who hope to become wives, come here to pay their devotions . . . All this seemed to come in very fitly at the beginning of my travels. I pushed my arm through the hole in the stone. I rubbed my back against the rock which cures the troubles of the back, and my head against another, thus ensuring my health for the remainder of my journey. I even tried to embrace the pillar, but I cannot tell with what result. As to the Saint’s Bed, I thought there was little danger of my dying from the malady against which it insures, and therefore I did not climb . . .
. . . I arrived at Cork, the dullest and dirtiest town which can be imagined. The people met with are yawning, and one is stopped every minute by funerals, or hideous troops of beggars, or pigs which run the streets in hundreds, and yet this town is one of the richest and most commercial of Europe . . .
. . . There is no town where there is so much needful to do to make the place agreeable to a great number of the poor inhabitants. The spirit of commerce and self-interest has laid hold of all branches of the administration. For example, it would be very easy to furnish the town with a public fountain, but the person or company which has the privilege of bringing water in pipes to the houses thinks that by the building of such a fountain there would be lost a number of guinea subscriptions. Therefore, in order that the avidity of an obscure individual should be satisfied, thirty thousand inhabitants must suffer . . . I have seen poor people obliged to collect the water falling from the roofs on a rainy day, or to take it even from the stream in the streets. All the time there is perhaps hardly a place which it would be so easy to supply with water as Cork, by reason of the heights which surround it. There is even a spring or fountain about a mile away, which is called Sunday’s Well, which appears to me to have sufficient water for the supply of a public fountain in the centre of the town . . . The dirt of the streets in the middle of the town is shameful, and as if that were not enough, it would seem as if it were wished to hinder the wind and the sun from drying the filth, for the two ends of the street are terminated by prisons, which close the way entirely and prevent the air from circulating . . .
. . . From here I proceeded to Wexford, and without wishing it harm, I may say that it is one of the ugliest and dirtiest towns in the whole of Ireland. The excessive exercise in which I had indulged, and to which I had not been accustomed for a long time, compelled me to remain here eight days with a fever . . .
. . . In every country of the world the peasant pays tithe with reluctance ; everywhere it is regarded as an onerous impost, prejudicial to the spread of cultivation, for the labourer is obliged to pay on the product of his industry. In Ireland it seems to me a more vexatious tax than elsewhere, for the great mass of the people being Catholic, it seems to them hard that they should be obliged to maintain a minister who is often the only Protestant in the parish, and who exacts his dues with rigour. Beyond the ordinary tithe he has a right, over nearly the whole of Ireland, to one-tenth of the milk of a cow, one-tenth of the eggs, and one-tenth of the vegetables of the gardens. One can easily understand that these conditions may be very severe when the minister exacts his dues in kind, and especially when it is considered that these poor miserable folk have, as well, to supply a subsistence for their own priests. They have often made complaints and claims in connection with this subject, and to these it was hardly possible to give attention without overturning the whole of the laws of the Establishment, as it is called; that is to say, the Established religion. 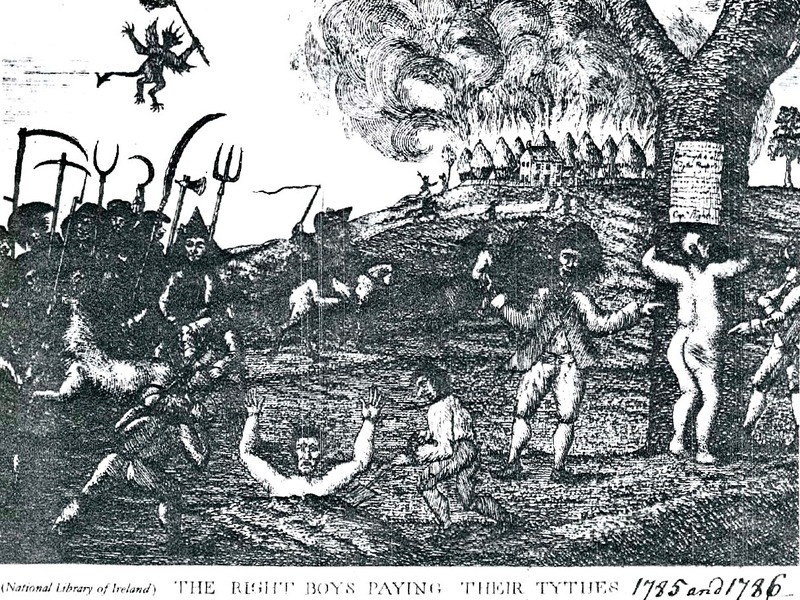 From complaints and claims the peasants came to threats, and from threats to the execution of the things threatened. They assembled at night in great numbers in certain parts of Ireland, and in order that they might recognise each other safely, they wore their shirts outside their clothes, from whence came the name of White Boys. In this garb they overran the country, breaking the doors and gates of ministers’ houses, and if they could catch the cattle they mutilated them by cutting off their tails and ears. All the time they did no other violent act, and a traveller might have gone through the country with perfect security . . . 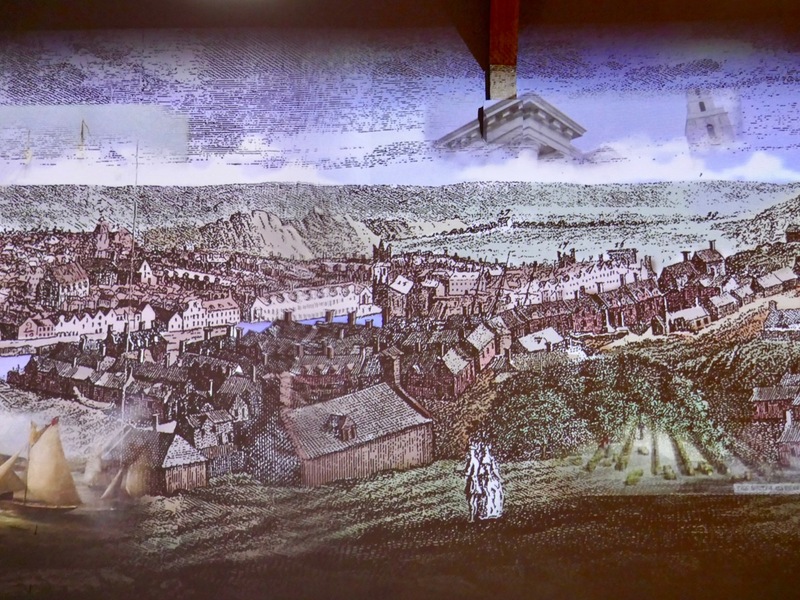 If you want to find some remote Irish history which is a long way off the beaten track, try the city of Dublin! 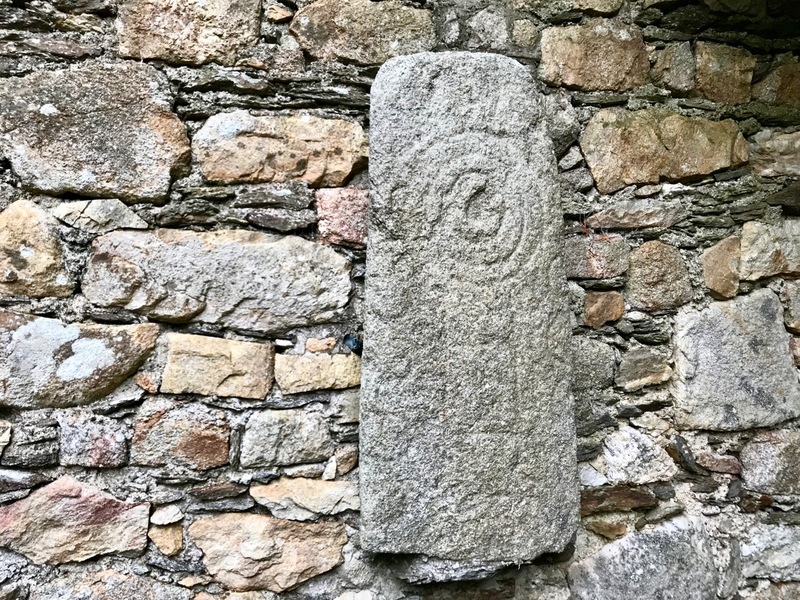 Just a few minutes’ drive from the edge of this bustling metropolis (and down a long, rough and muddy farm track) is a collection of carved stones which have their roots in the time of the Vikings. 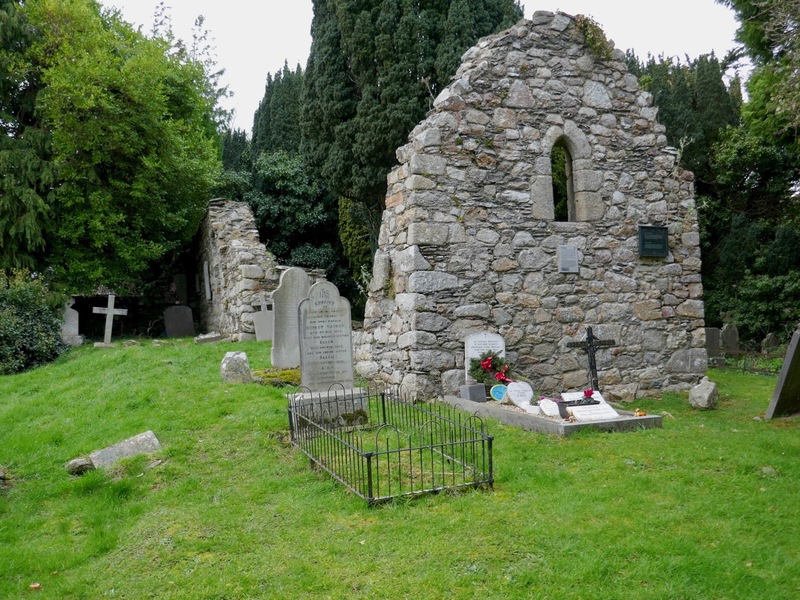 Here, in the barony of Rathdown, the remains of a small ruined church date from the twelfth century, but a monastic settlement was set up long before that by St Comgall of Bangor, who lived from 520 to about 600 AD. There is the stump of a round tower here, known locally as the Skull Hole, as bones from the surrounding graveyard were thrown in here. Some say, also, that it is actually the entrance to an underground tunnel going down to the coast: furthermore, a piper was once seen to enter the tunnel playing his pipes – but was never seen again! 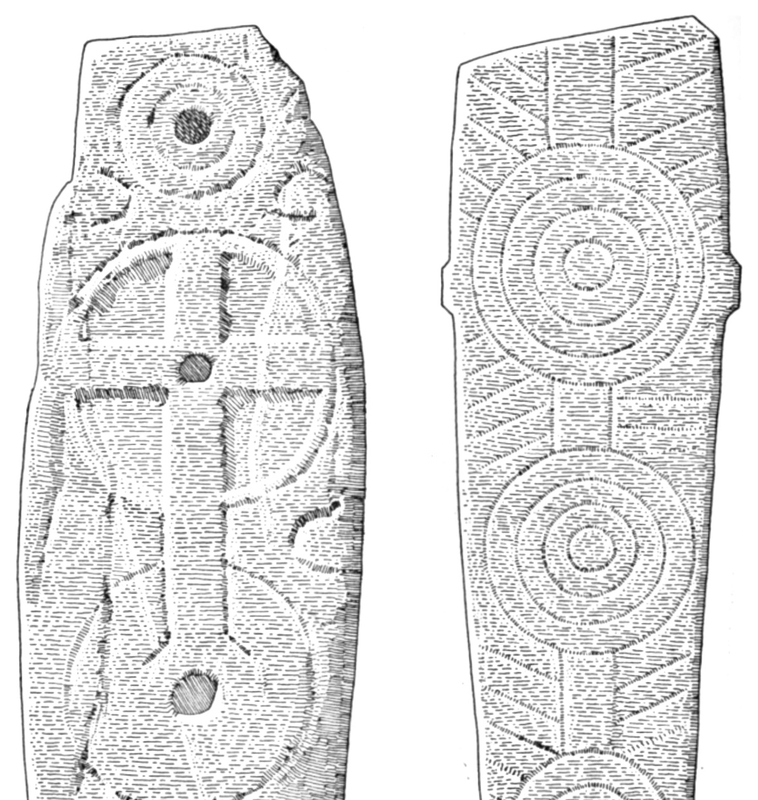 But the real treasure of the place are the carved stones which date from Viking times, and which are probably early Christian grave markers. They are generally known as The Rathdown Slabs. Some of these we would classify as ‘Cross Slabs’, even though, on some, the cup marks and concentric circles make us think of Prehistoric Rock Art. Well worn by time and weather we can still make out the various motifs – and we are fortunate to have good drawn records of these stones dating from a study carried out by Pádraig Ó hÉailidhe, a member of the Society of Antiquaries of Ireland, and published in volume 87 of the Journal of that Society in 1957. From around 850 AD we find mention of Norse names: Amláib (Olaf the White) arrived in Dublin in 853 and ruled jointly with Ímar (Norse Ívarr inn beinlausi – ‘Ivar the Boneless’). 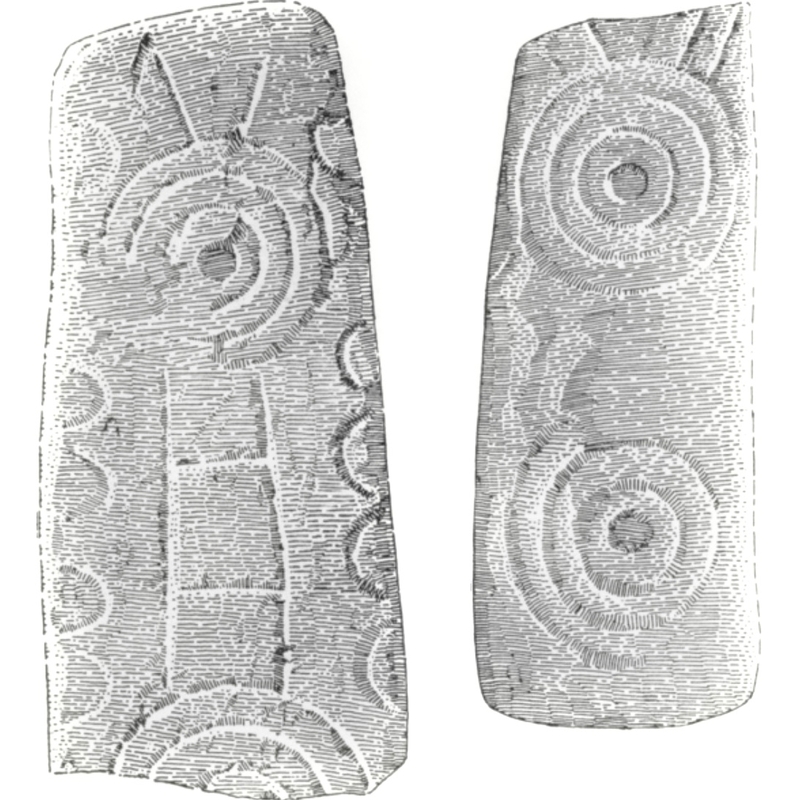 Amhláib was a Norwegian but Ímar may have been a Dane. Ímar is mentioned as ‘king of all the foreigners in Ireland’ at his death in 873. 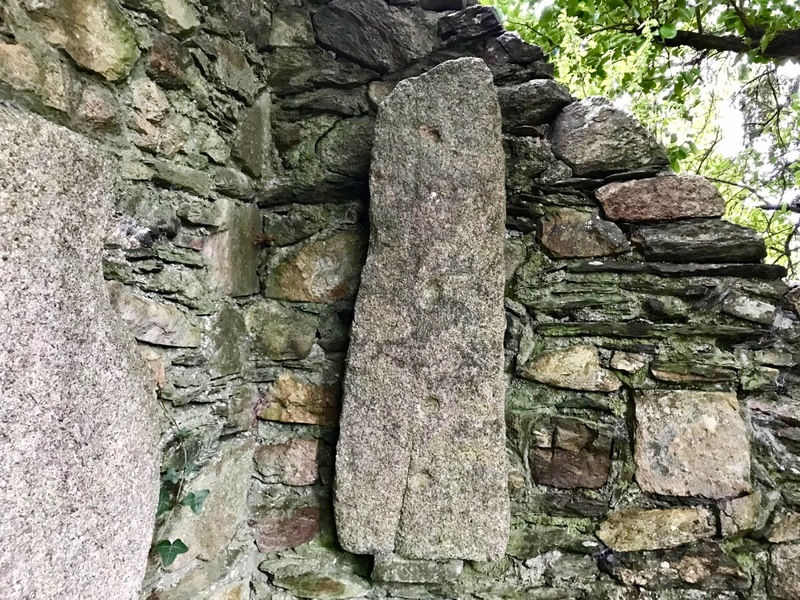 The grave slabs at Rathmichael probably date from the time when Viking settlements were established in the Dublin area, and – although we tend to think of the Vikings as plunderers of monasteries – it seems that they began to follow Christian practices once they settled in Ireland. 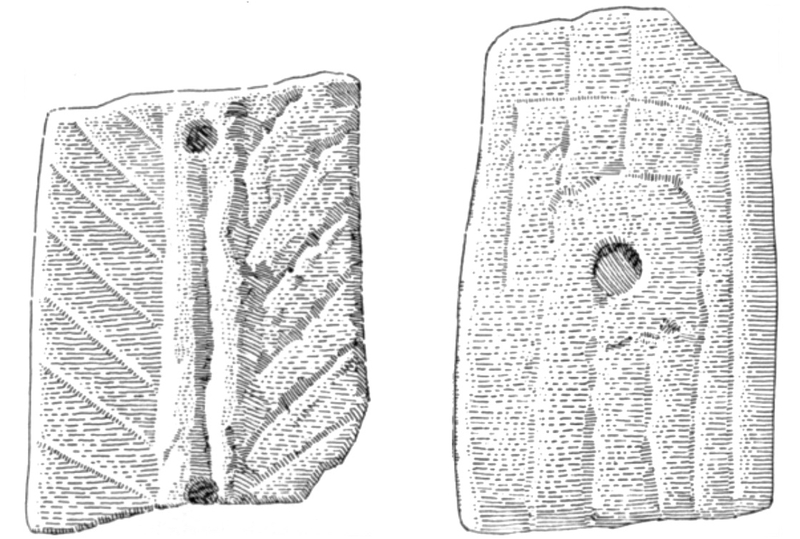 Other – probably related – inscribed slabs from the wider area are recorded by Pádraig Ó hÉailidhe (below): Dalkey Castle Heritage Centre displays one of the finest of them all (left), while the Tully Slab (right) is assumed to have come from another remote church ruin close by – however I cannot find any record of its current whereabouts. If anyone can throw light on this, please let us know. 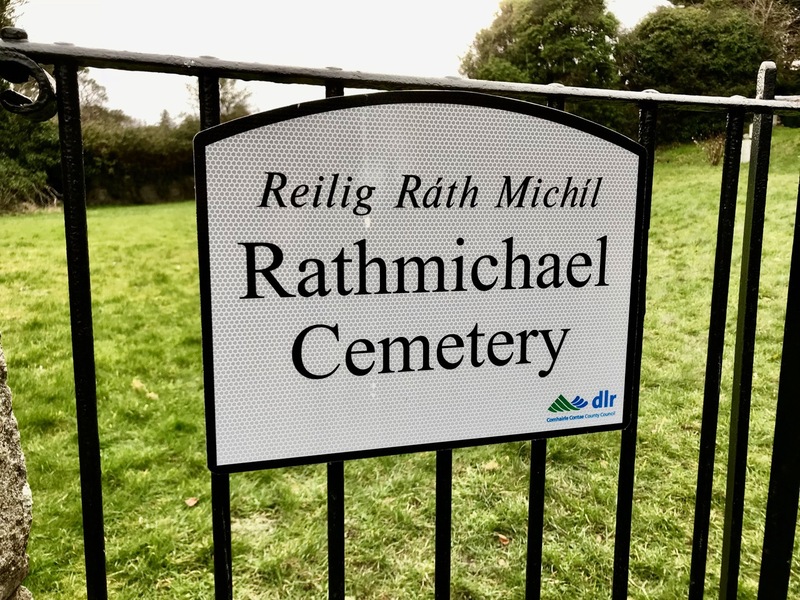 I have used the drawings by Ó hÉailidhe because they are so clear: we visited the Rathmichael site this week and were struck by how faded much of the inscription seems to be. It could be that we were not seeing the carvings in a good, clear light. 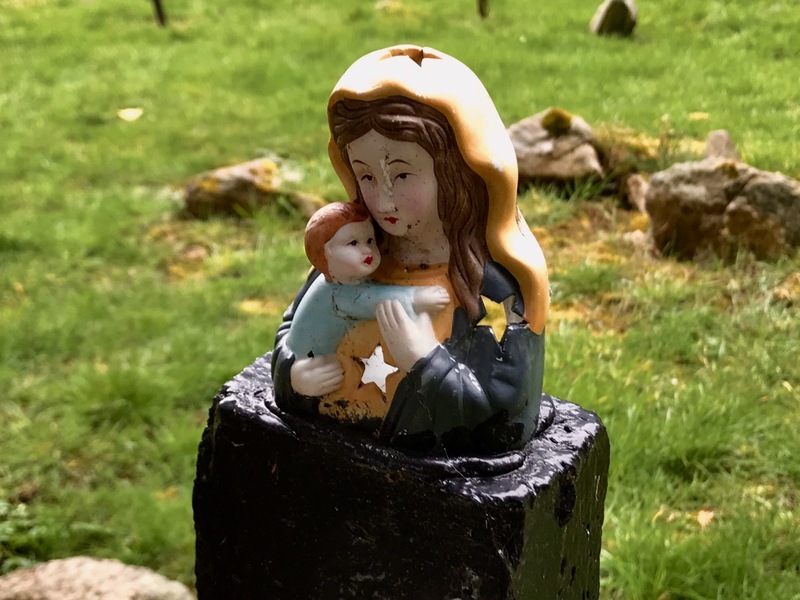 Worryingly, it may also be that the stones are suffering from accelerated weathering (much as our unprotected medieval high crosses appear to be) due to acid rain and pollution. You can see for yourselves by comparing the drawings above with our own photographs, a selection of which form the tailpiece of this post. 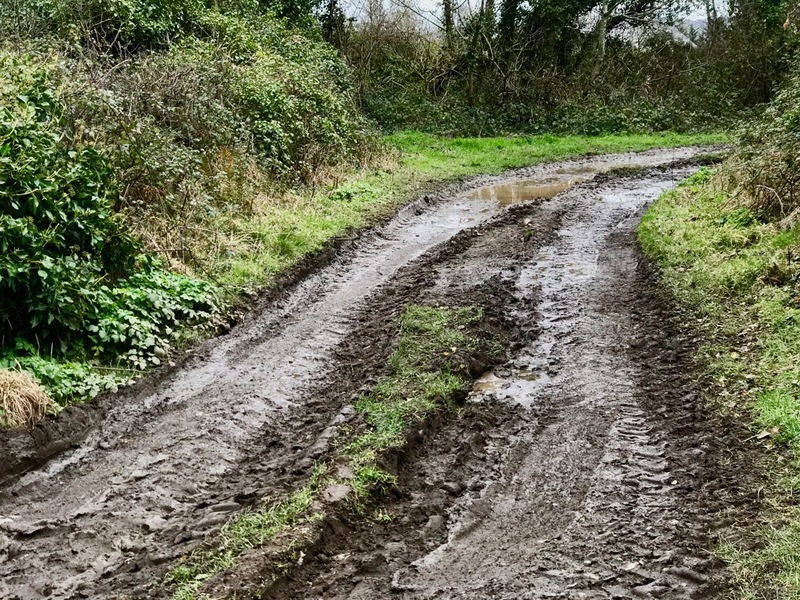 Betjeman in Ireland – Poet and Spy? I remember well the day they buried Sir John Betjeman. 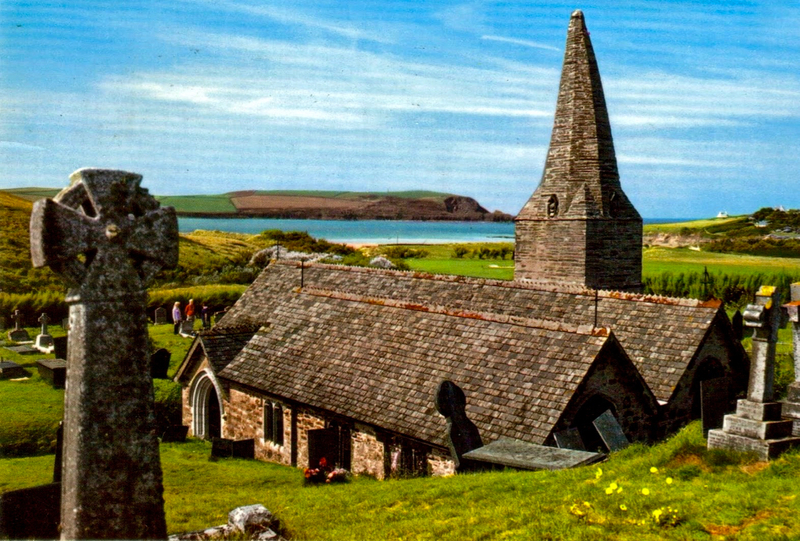 The graveyard of St Enodoc’s Church (above, from a 1970s postcard), is close to the Cornish village of Trebetherick – his home for many years. On that day in May 1984 there was a downpour of torrential proportions, and all that could be seen when they laid him to rest was a sea of black umbrellas. The poet himself would have loved the very English spectacle of it. …Come friendly bombs and fall on Slough! What is there that one can say? Shapes the cross of joy or sorrow. What is there for me to say? Crumply in dry winds again. Wish her lots and lots of joy. Like a war she won't remember. And there's nothing more to say. Betjeman is also particularly remembered for the part he played in bringing Laurence Olivier to Ireland to film Henry V on the Powerscourt Estate. This film, itself a piece of wartime propaganda, brought a short period of prosperity to County Wicklow in 1943. 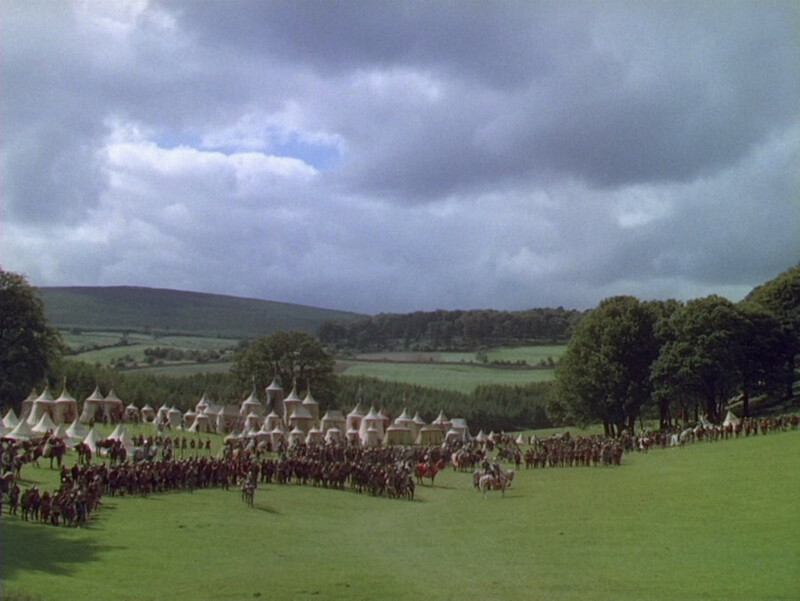 The doughty yeomen who faced the French in the Agincourt battle scenes were actually Irish farmers: these ‘extras’ each received an additional pound if they brought along their own horse! We heard hearty cheers coming across the water on Friday, when Ireland won the Olympic silver medal in the Lightweight Men’s Double Sculls Final. The cheers we heard were not coming from Rio, however (although there were plenty there), but from Lisheen, the tiny West Cork parish that’s just around the corner from us. That’s where Gary and Paul O’Donovan hail from. 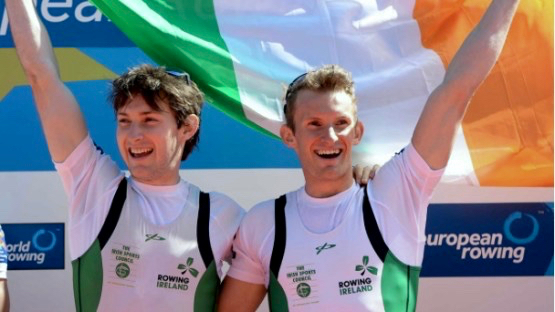 We think they have declared a public holiday there in honour of the two rowing brothers who, prior to this title, won gold at the European Championships in Brandenburg in Germany this year – the first Ireland rowing crew to become European Champions. This success set me looking at the records of Irish Olympic achievements over the years. Independent Ireland was represented at the Olympic Games from 1924 onwards. 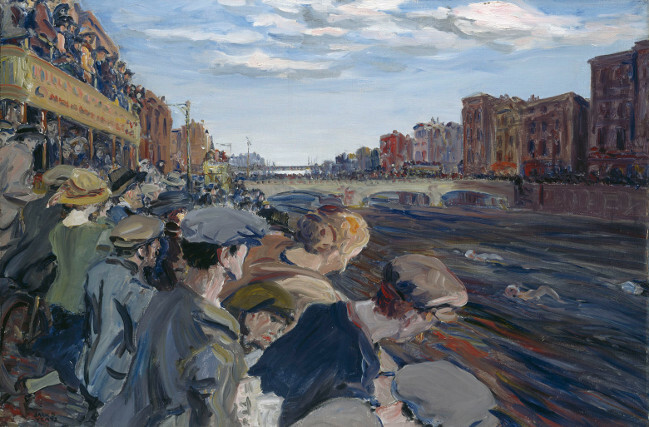 No Irish athletes won medals in 1924 but Jack Butler Yeats won a silver medal for the above painting and Oliver St John Gogarty won a bronze medal for literature in that year. 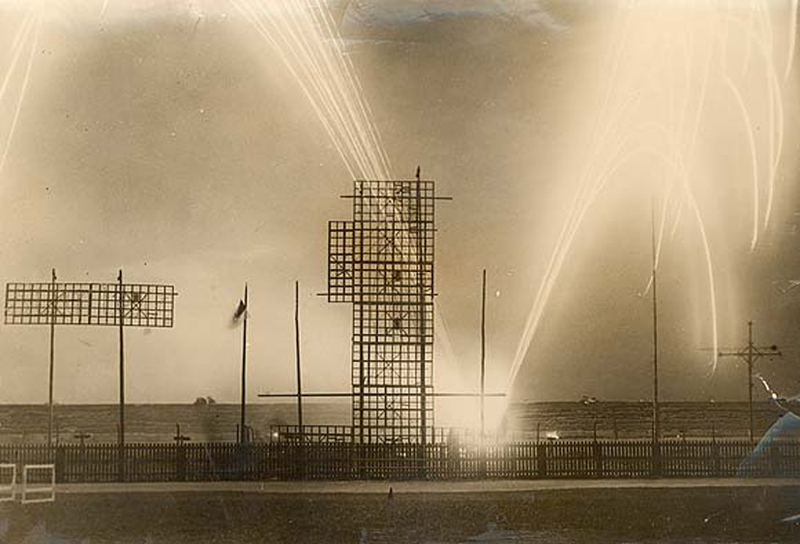 Did you know that between 1912 and 1948 competitions in the arts were part of the Olympic Games? For a small nation Ireland has made its mark in the games: in Melbourne in 1956 Irish athletes and boxers won 5 medals between them – a gold, a silver and three bronze, and in London in 2012 boxers, athletes and a showjumper won 6 medals – a gold, a silver and four bronze. 1996 was a memorable year when, in Atlanta, Michelle Smith won 3 golds and a bronze for swimming. While researching this information I came across Tailteann Games. The word is pronounced ‘tell-tin’. 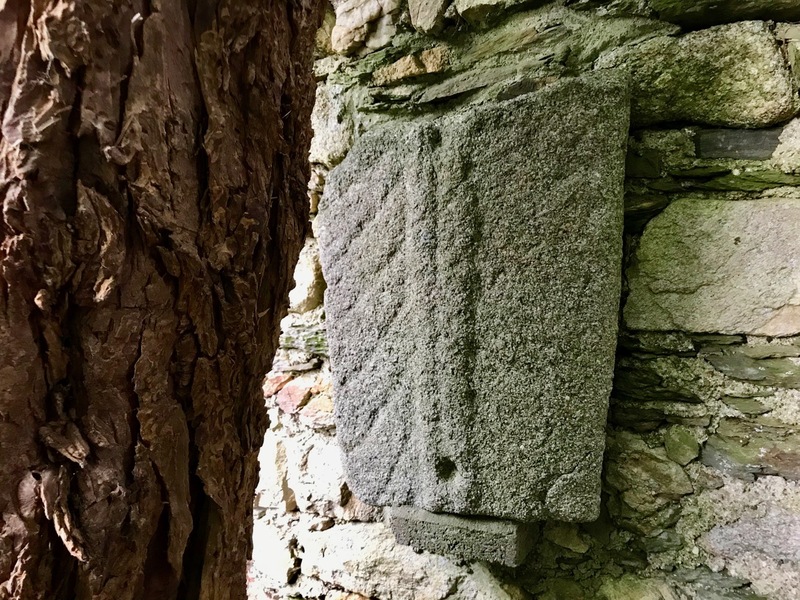 The eleventh century Lebor Gabála Érenn (the Book of the Invasions of Ireland) states that the games were founded by Lugh Lámhfhada, Lugh of the Long Arm – the first High King of Ireland – as a mourning ceremony for the death of his foster-mother Tailtiu. 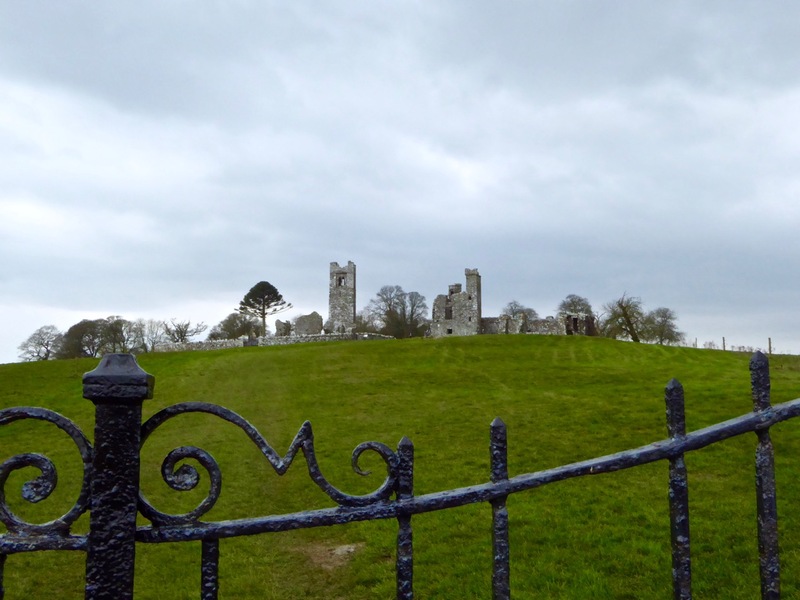 Lugh buried Tailtiu underneath a mound in an area that took her name and was later called Teltown in County Meath, not far from the Hill of Tara. It’s perhaps significant that the games took place around the festival of Lughnasa – at the beginning of August. Accounts vary as to the historical periods in which the games were held: some say as early as 1800 BC, while a more generally accepted dating seems to be from the 6th to the 9th centuries AD: the festival died out after the Norman invasion but was later revived as the Tailten Fair, consisting of contests of strength and skill, horse races, religious celebrations, and a traditional time for couples to contract ‘trial’ marriages. These were allowed under Brehon Laws: couples could meet and live together for a year and a day – at the end of this time either party could end the marriage on the ‘Hills of Separation’. 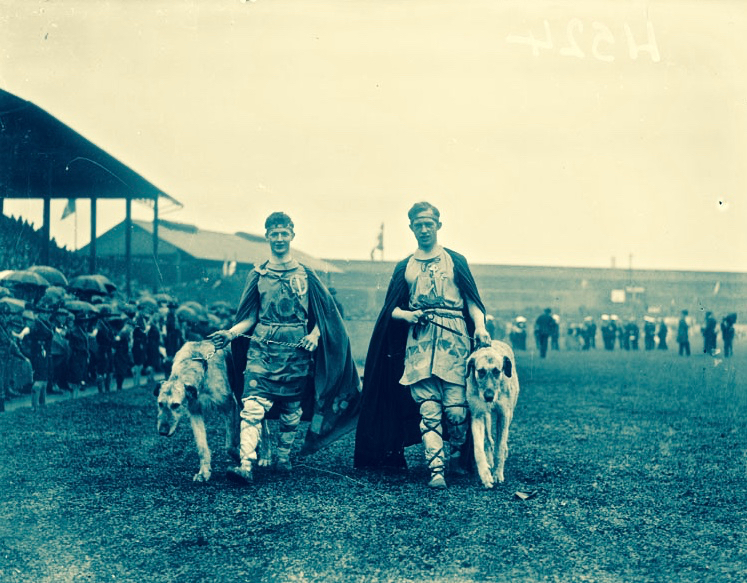 While the 1924 Olympics were being held in Paris (where Finola’s grandfather was a member of the Irish team) a revival of the Tailteann Games was held in Croke Park, Dublin. This ‘meeting of the Irish race’ or ‘Irish Olympiad’ had been announced by Éamon de Valera in Dáil Éireann in 1921 to celebrate the founding of the Irish Free State, but the event was delayed because of the Anglo-Irish War and the Irish Civil War. Organised by the Gaelic Athletic Association (GAA), it was open to all people of Irish birth or ancestry. Participants came from England, Scotland, Wales, Canada, the USA, South Africa and Australia as well as Ireland. 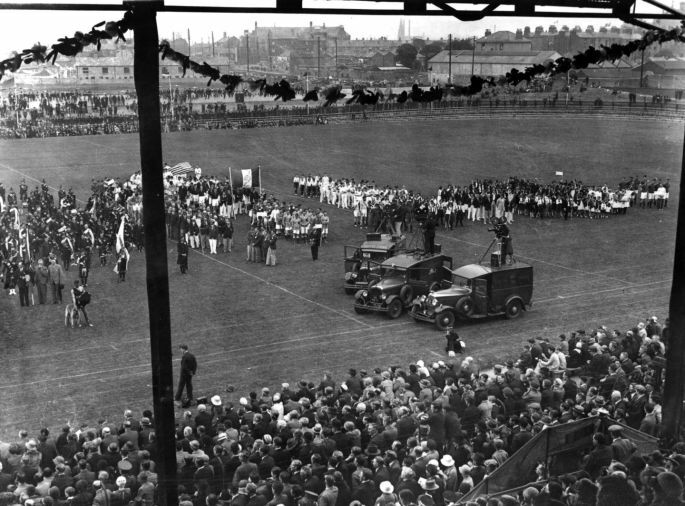 Tailteann Games were held again in 1928 and 1932. The name survives today as Rás Tailteann, which is an 8 day international cycling race around parts of Ireland. This race has run every year since it was founded in 1953 and has developed into a much sought after event by professional and amateur teams from many parts of the world: it is able to award qualifying points that are required for participation in Olympic Games and World Cycling Championships. Who made the trails through stone mountains? Who knows the age of the moon? Who knows where the setting sun rests? Who took the cattle from the house of the Warcrow? Who pleases the Warcrow’s cattle? What bull, what god created the mountains’ skyline? The cutting word – the cold word? …Slaine, whence the name? Not hard to say. Slaine, king of the Fir Bolg, and their judge, by him was its wood cleared from the Brugh. Afterwards, he died at Druim Fuar, which is called Dumha Slaine, and was buried there: and from him the hill is named Slaine. Hence it was said: Here died Slaine, lord of troops: over him the mighty mound is reared: so the name of Slaine was given to the hill, where he met his death in that chief abode…. The ‘mighty mound’ must surely be the enigmatic earthworks hidden in the trees to the west of the abbey and college ruins: these are variously described as a barrow or a motte. 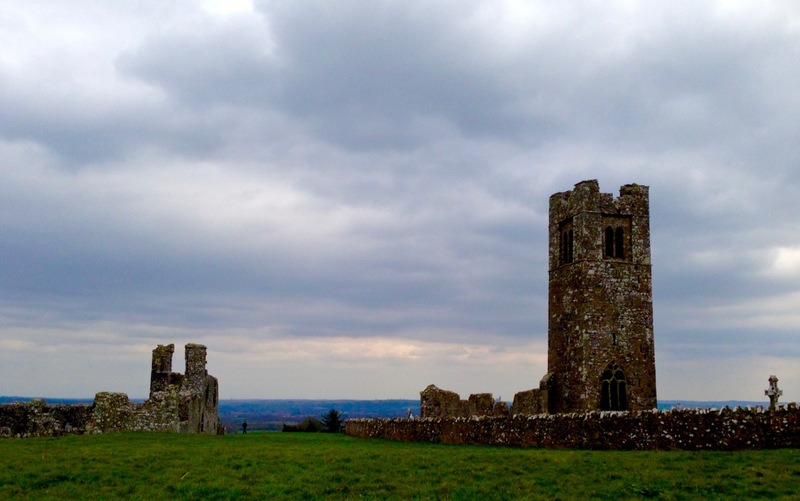 Mostly what we see today on the summit here is medieval: the hill remained a centre of religion and learning for many centuries after St Patrick. A friary church was established on the site of an earlier monastery in 1512: it was abandoned in 1723. Beside it is a medieval college, probably also 16th century. The stonework here includes some extraordinary carvings, sadly much dilapidated. 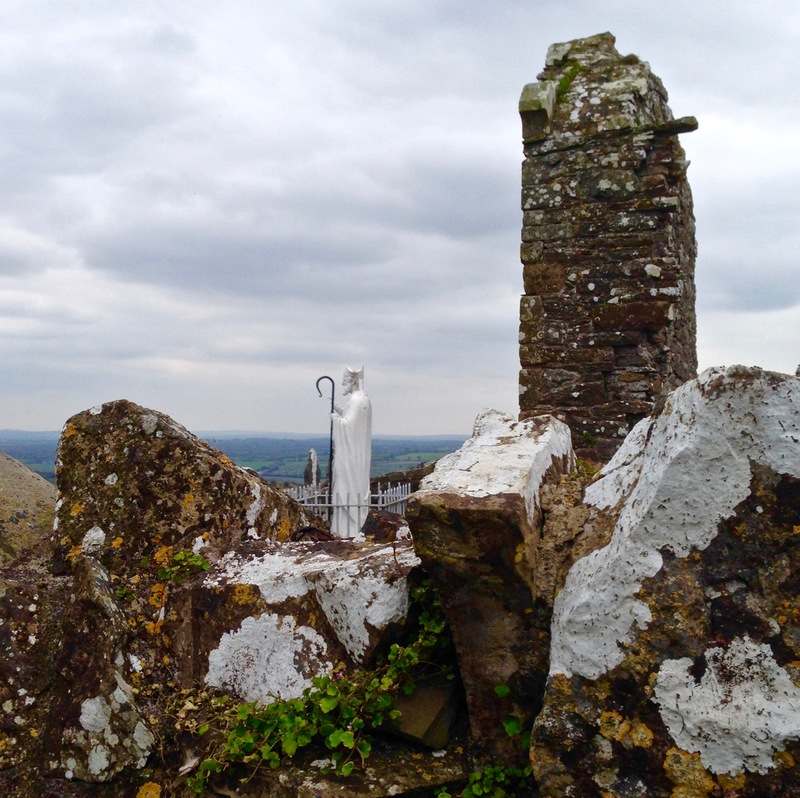 If nothing else, the theory at least demonstrates that St Patrick’s influence stretches the length and breadth of the country: witness his statue looking out from the Hill of Slane and another looking across from the lower slopes of The Reek! St Patrick (his day was last week), Easter (this weekend), the Boyne neolithic monuments, Irish poetry, ancient kings and their battles, a little bit of astro-archaeology, the commemoration of the 1916 uprising in Dublin, the fight for Irish freedom… All seem to have joggled along beside each other in our recent explorations. Somehow they fit together and define an Irish-ness which is all-encompassing but not overwhelming. History is dancing all around us: alive and relevant. Glasnevin is one of Ireland’s top tourist attractions – a cemetery, imagine! This is all the more remarkable when you realise that only a few years ago it was a tangled mess of weeds and ivy with row upon row of broken and fallen headstones, neglected and unsung. Now, after an extensive restoration project there is a handsome new museum (the world’s first cemetery museum) and avenues of statuary and bowers the like of which you might see in Paris. But of course it’s who is buried here that marks it as a focus for this year of commemoration. 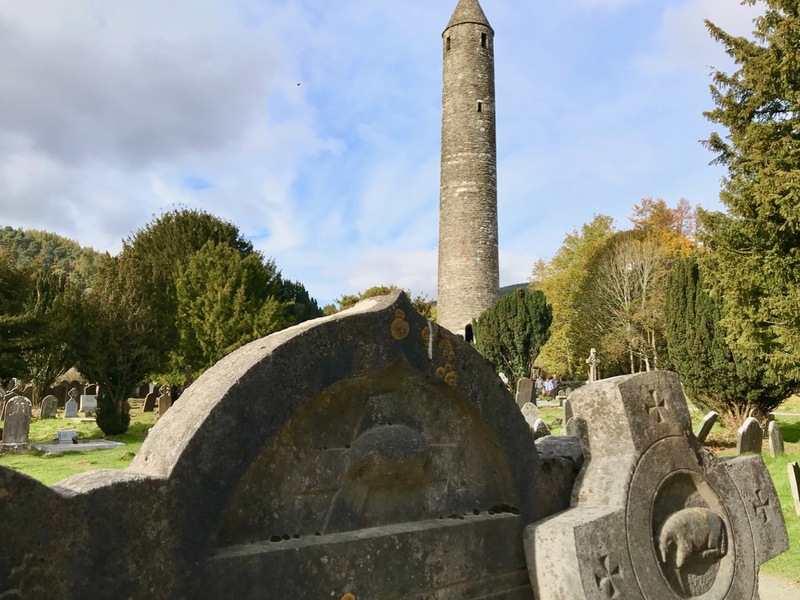 The giants of Irish history – poets and politicians, painters and writers, priests and suffragists – can all be found here. And, most impressively, all religions. 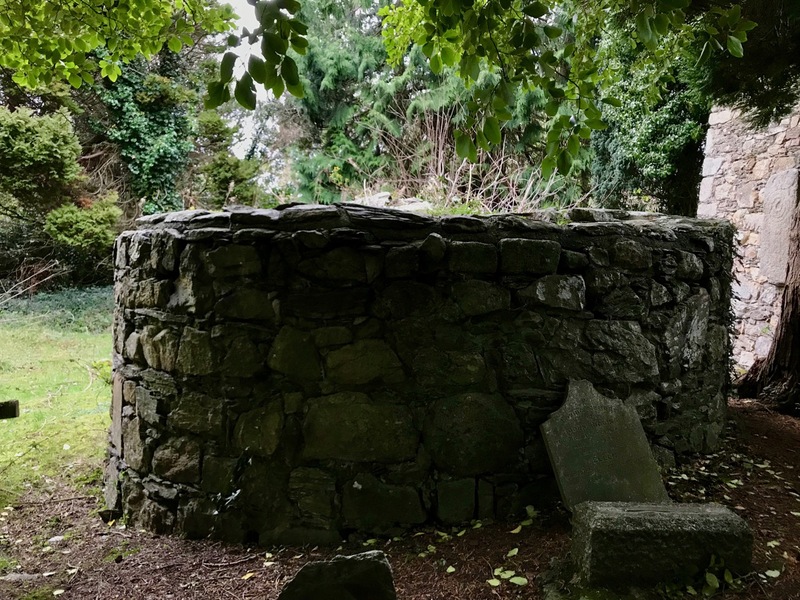 Daniel O’Connell, whose crypt and round tower dominate the scene, helped to found this graveyard as a burial place for all denominations. The history of headstone trends can be read in this graveyard too. 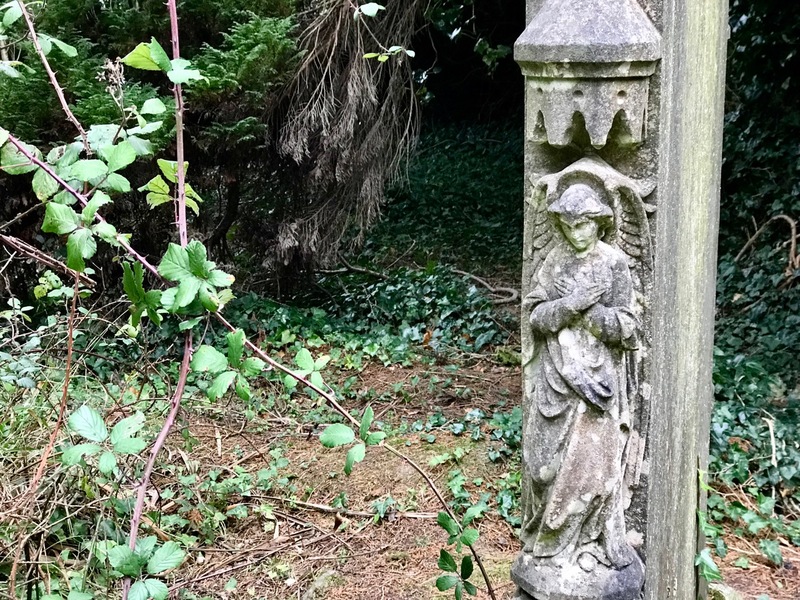 Victorian statuary and sylvan avenues dominate the earlier periods but it was all Celtic Crosses and Maids of Erin at the turn of the century. The modern period has brought austere and understated granite slabs. Last year, the focus was on O’Donovan Rossa (see my posts about Rossa here and here and here). The oration at his graveside in Glasnevin was given by Patrick Pearse: it was re-printed and widely distributed and is usually credited with marking an important starting point to the 1916 Rising, one year later. 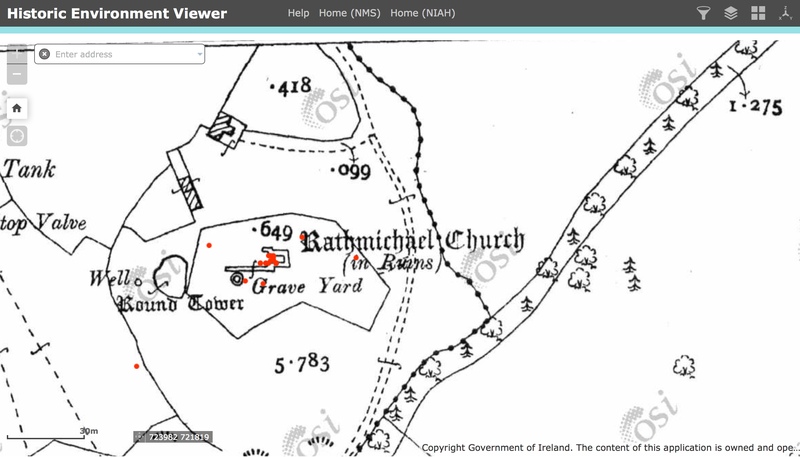 Many of the participants in that rising found their final resting place here in Glasnevin, although not the leaders who were immediately executed, most of whom were buried in quicklime at Arbour Hill cemetery, in what was once a prison yard. But here are Eamon de Valera, Countess Markievicz, Thomas Ashe, Harry Boland, Cathal Brugha, Austin Stack, Sir Roger Casement, Elizabeth O’Farrell (see below) and many more. They were men and women, Catholic and Protestant: although the new state that grew from independence was predominantly Catholic, many Protestants numbered in the ranks of the revolutionaries. See the always entertaining Come Here To Me blog for a thorough investigation of this. Of all the graves the most famous belongs to Michael Collins, about whom Robert has written. Collins’ grave has the distinction of being the most visited in the cemetery, and always has fresh flowers on it. But the most startling and important association that Glasnevin Cemetery has with 1916 is not captured by the roll call of the leaders and foot soldiers of the IRB and Volunteers who fought in the various actions. No – the real story here is in the sheer numbers of people who died during that conflict and who were buried here. That number (so far) is 485 men, women and children. This major research work has revealed many interesting and previously unknown facts. The majority of the dead were civilians, 54% of the total dead, caught up in the fighting. British Army dead accounted for 26% of those killed while the rebel forces had 16% of the casualties. The remaining percentage is made up of members of the Dublin Metropolitan Police and Royal Irish Constabulary. The numbers of civilians killed each day steadily increased, peaking on the final day of the rebellion 29 April when 45 died. This was also the most violent day of the rebellion during which 78 people lost their lives. 26 April, the day of the Battle of Mount Street Bridge, was the worst for the British Army losing 30 men during the fighting throughout the city. The rebels also suffered their worst casualties on this day with 13 men killed. For the police the day of the Battle of Ashbourne, 28 April, proved to be their worst. The vast majority of those killed were buried at Glasnevin Cemetery in the aftermath of the fighting. 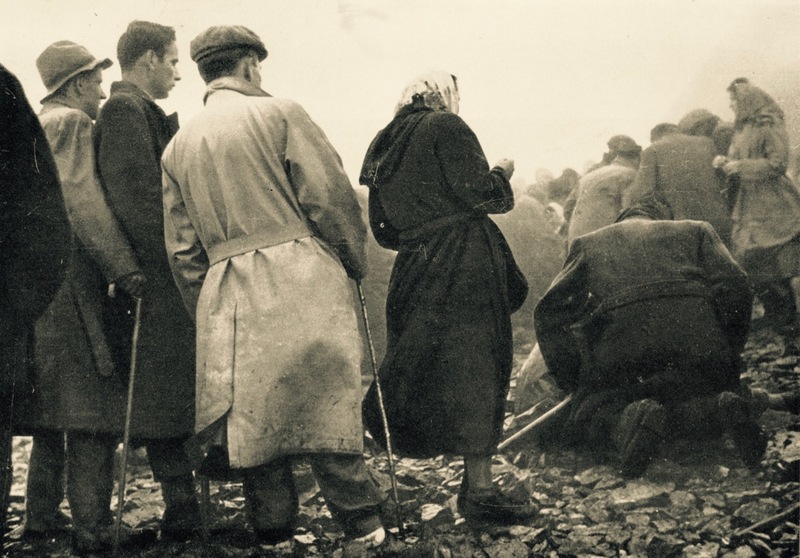 The staff of the cemetery struggled to deal with the large numbers of bodies being brought for burial. Despite great strain they succeeded in giving all a dignified burial and recorded their details in our registers. If you’re in Dublin, do go on a tour of Glasnevin Cemetery. And when you’re there, stop at the new memorial to all those who died in the 1916 Rising (to be unveiled in early April), and reflect not only upon the insurgents or the soldiers and policemen, but upon the innocents. It is fitting that their lives and their deaths should also form part of what we remember and understand about that week of conflict. And that planned new memorial – a ‘necrology wall’ listing the 485? It is, inevitably, controversial. Depending on what you read it is either a bewildering, ‘bizarre’ and revisionist decision, or a brave new effort to recognise all the dead equally and non-judgementally. But perhaps that is, after all, the job of a cemetery. 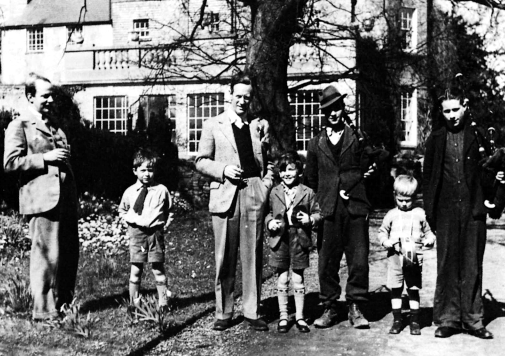 And if you can’t get to Glasnevin, try to see the film One Million Dubliners. 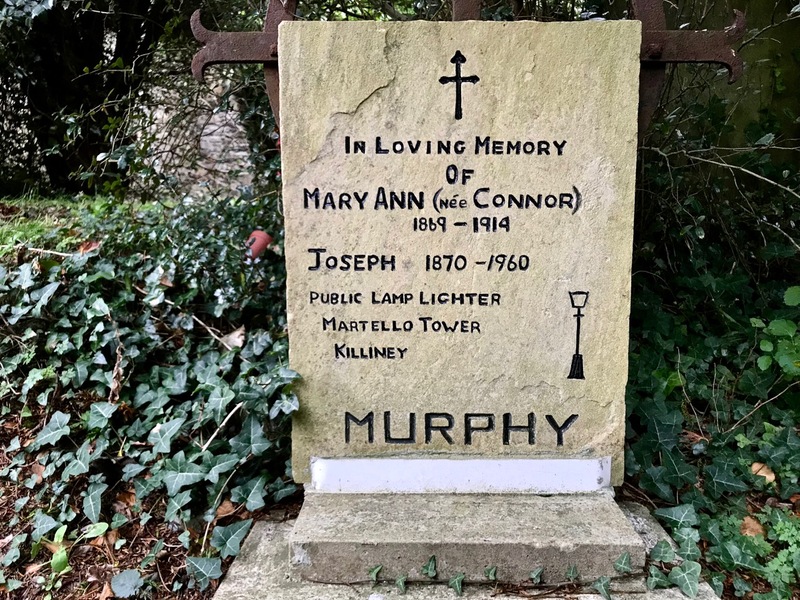 It’s a brilliant, moving, evocative and beautifully made film that will show you why this historic cemetery has so rightly earned its place as one of Ireland’s major tourist attractions.